Adaptive Multi-Paddock (AMP) grazing uses high livestock densities for short durations between long periods of forage rest to catalyze accelerated grass growth. 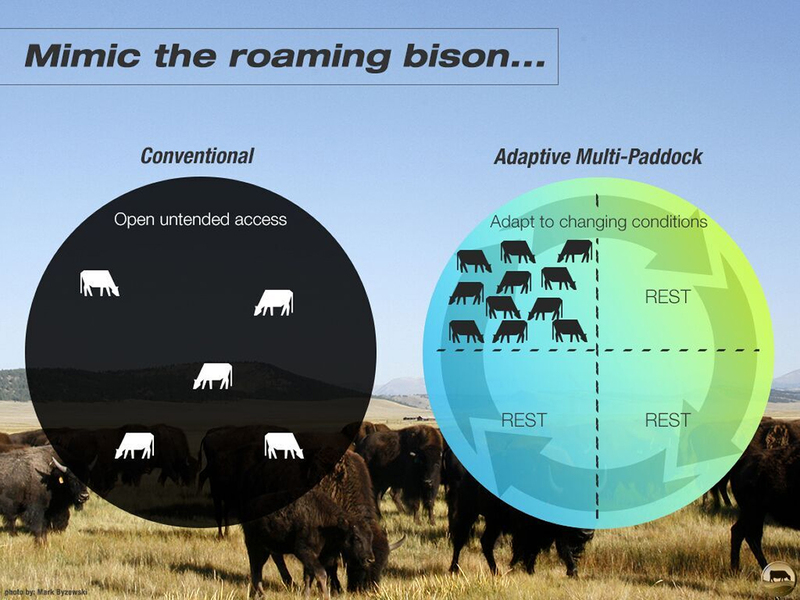 The system is not scheduled or prescriptive, but moves the animals in response to how land and life respond. AMP grazing is thus highly observant and adaptive. The system mimics the natural pattern of dense herds of wild ruminants moved frequently by the forces of predation and food availability. Scientific studies have documented the potential for AMP grazing methods to capture and hold material volumes of both carbon and water in improved soil, and thus simultaneously improve both quantity and quality of forage. We thus maximize sunlight capture throughout the year in reliable quantities of high quality plant biomass, and then monetize that forage via antibiotic and hormone-free beef raised on eating nothing but grass in open pastures. The science of animal, grass and soil ecosystem is complex. There’s more that we don’t know than what we do, but we’re beginning to understand the basics. In short, AMP grazing works because it actively regenerates soil by capturing more sunlight. If grass is left to grow, as the season goes on, growth tapers off. While the grass is growing, the plant roots ‘leak’ carbon compounds to soil microbes in a barter economy that trades sugar for nutrients that the grass needs to grow. If a cow takes a bite, then keeps coming back, the good grasses are overgrazed and the soil becomes bare. At the end of the season, dead grass decays back into CO2 so little carbon accumulates in the soil. However, if cows are grazed intensely but briefly through small paddocks, consuming no more than 50% of total leaf volume, rest periods are increased and grass growth becomes more vigorous. More grass growing means more carbon leaking into the soil root zone to feed microbes in exchange for nutrients. Longer rest periods also lead to greater plant diversity and complexity that creates greater microbial diversity and complexity. Most of the grass and water the cows eat ends up back on the pasture as manure and urine – now more evenly spread. Some of the grass gets trampled into the soil, too, where it can also be food for microbes. Some of this decomposing organic matter is respired back into the air, but some of it adds to the ‘leaky’ carbon building up in the soil system. As the soil organic matter builds, the soils develop more porosity and permeability that allows more water to infiltrate. Of course, the extra water also helps grow more grass, too. This process mimics the system created by nature when large herds of ruminants roamed the grasslands of the Earth.